Citation: Sturm T. Environmental Organism Transfer. J Plant Biotechnol Microbiol. 2018;1(1):25-7. There are numerous bacteria, yeast and molds living in the surrounding environment that can be transferred to other organisms via contact. Shoes and hands were either swabbed or pressed onto TSA agar plates and incubated at 37°C for 48 h, then room temperature for 72 h, and then plates kept at refrigerated temperature for up to a week. Different incubation temperatures allowed different species of bacteria, yeast, and mold to grow from one sample. Organisms normally found on the body would grow at 37°C while room temperature and refrigerated temperatures yielded environmental yeast and molds. As seen in the images below Bacillus spp., a common spore forming soil bacteria is the majority of growth seen throughout the samples and grew well at warm incubation temperatures while growth of the colorful yeast and molds took longer to grow and were less abundant. Everything seen in these images are naturally occurring environmental organism and are normally harmless. Hand washing; Soil bacteria; Immune system. Over the past several years a focus on hand hygiene and exposure to environmental organisms has been highlighted in the media as to what is “normal flora’ and what is not [1-4]. There are numerous bacteria, yeast and molds living in the environment that can be transferred to other organisms, humans as well as the things we wear or carry, via contact. Most organisms are not actively growing but have developed mechanisms to survive in harsh environments or at least remain in a “holding pattern” until they find good growing condition. A common adaptation is spore formation seen in molds and bacterial species such as Bacillus spp. and Clostridium spp. [5,6]. In the following images objects such as shoes and hands were either swabbed or pressed onto TSA agar plates and incubated at 37°C for 48 h, then room temperature for 72 h, then plates kept at refrigerated temperature for up to a week. Different incubation temperatures allowed different species of bacteria/yeast/mold to grow from one sample, either shoe swab or hand print. Organisms normally found on the body, (Staphylococcus spp., Micrococcus spp.) would grow at 37°C while room temperature (21°C) and refrigerated temperatures (4°C) yielded colorful environmental yeast and molds (Figures 1-9). Figure 1: Unknown Bacillus spp. seen from swabbing the bottom of a shoe. Colonies are dry, matt and rhizoid characteristic of Bacillus spp. (Shoe Swabs). 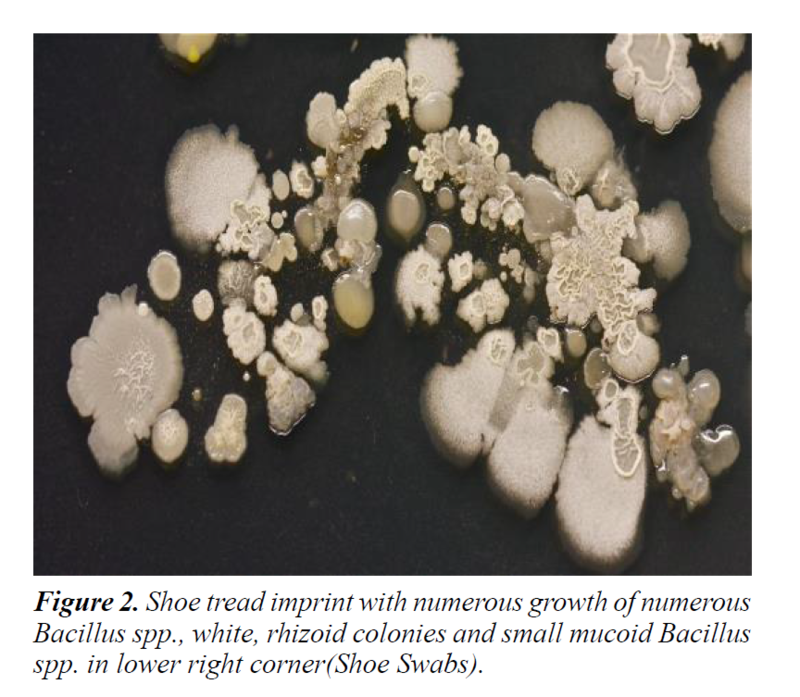 Figure 2: Shoe tread imprint with numerous growth of numerous Bacillus spp., white, rhizoid colonies and small mucoid Bacillus spp. in lower right corner(Shoe Swabs). 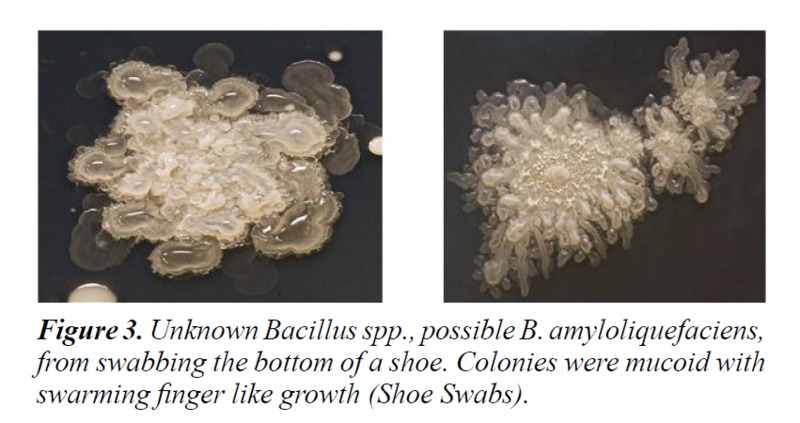 Figure 3: Unknown Bacillus spp., possible B. amyloliquefaciens, from swabbing the bottom of a shoe. Colonies were mucoid with swarming finger like growth (Shoe Swabs). Figure 4: Shoe swab with fungal growth, center with clear zone around growth indicating possible antibacterial properties (Shoe Swabs). 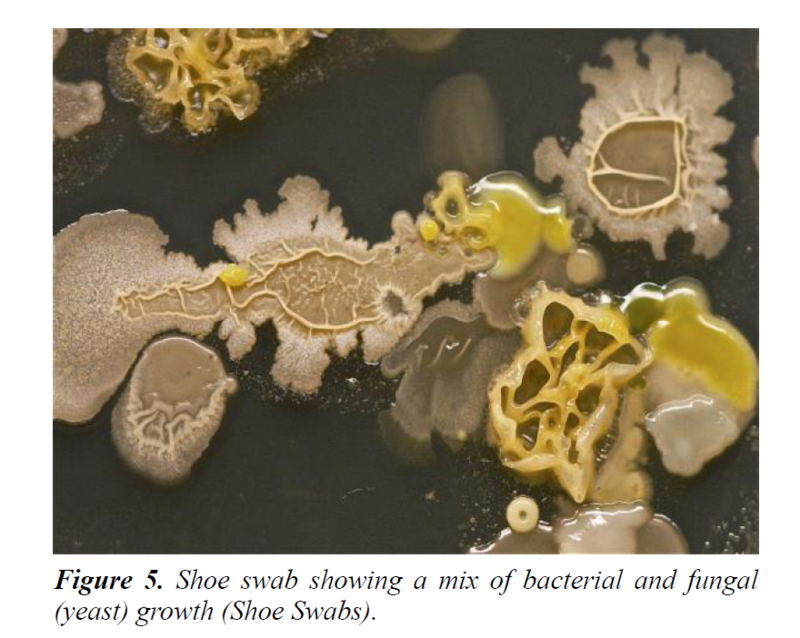 Figure 5: Shoe swab showing a mix of bacterial and fungal (yeast) growth (Shoe Swabs). Figure 6: Handprint done in colder wet weather. Note: branching swirling Bacillus mycodies seen on thumb and palm, absent in Figure 6 (Handprints). 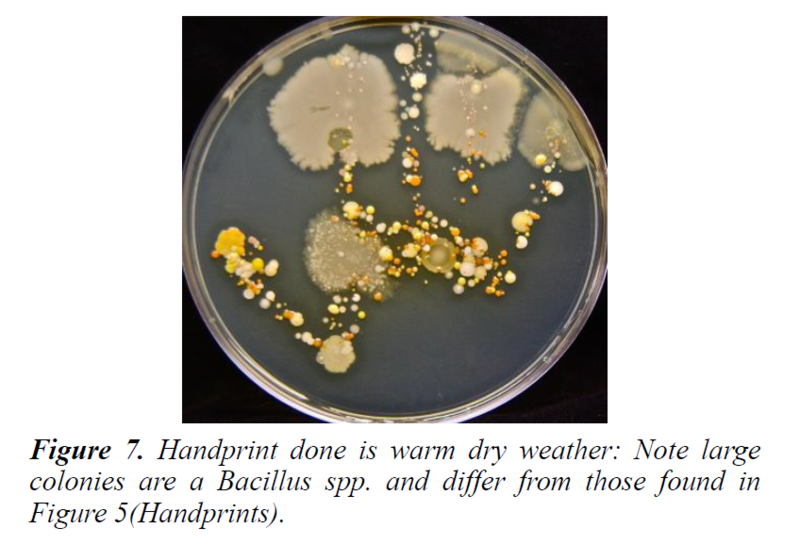 Figure 7: Handprint done is warm dry weather: Note large colonies are a Bacillus spp. and differ from those found in Figure 5(Handprints). 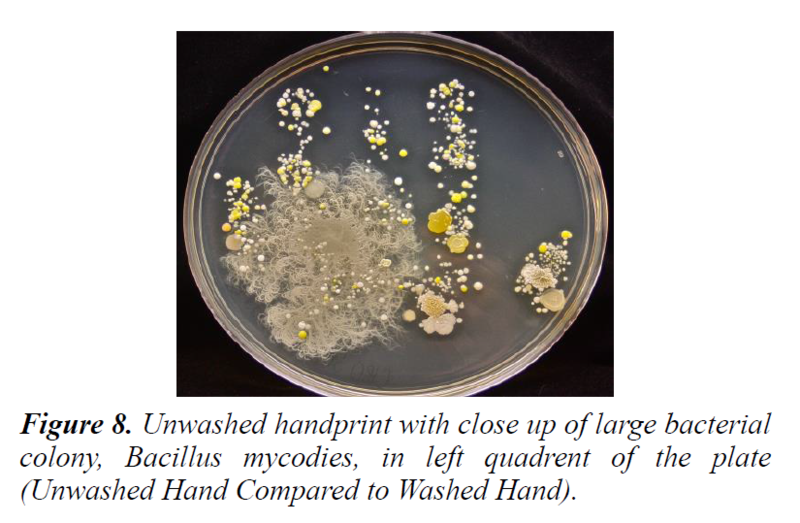 Figure 8: Unwashed handprint with close up of large bacterial colony, Bacillus mycodies, in left quadrent of the plate (Unwashed Hand Compared to Washed Hand). Figure 9: This is the same hand from Figure 9 after hand washing with soap and water (Unwashed Hand Compared to Washed Hand). 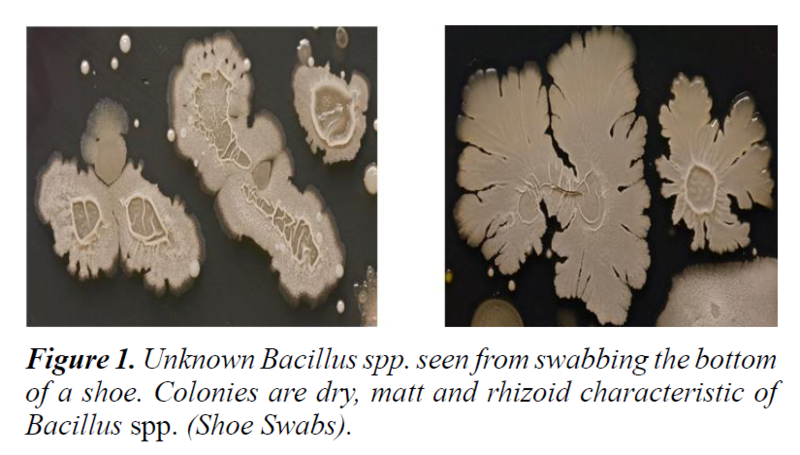 As seen in the images above Bacillus spp., a common spore forming soil bacteria, is the majority of growth seen throughout the samples, both hand and shoe swabs, and grew well at warm incubation temperatures while growth of the colorful yeast and moulds took longer to grow and were less abundant. Bacillus spp. seen in Figures 1-5 and 7 represent the majority of growth seen on the bottom of shoe swabs/prints. Not an unexpected result since Bacillus spp. is a common spore forming bacteria found in soil . Several morphologies are seen from dry, matt, rhizoid and spreading to mucoid spreading with finger like projections. Although not common occasionally a fungal colony is seen, Figure 6, with this one exhibiting potential antibiotic properties. Figure 7 does show a variety of unknown yellow organisms, possible yeast (Figures 3-7). With hand prints (Figures 8 and 9) it is interesting to note that there is a different mix of organisms at different times of the year with the colder wet weather yielding a less colorful print compared to the warm weather print yielding a colorful mix of orange and yellow yeast and bacteria. Also interesting is the morphology difference with Bacillus spp. on the two plates with Bacillus mycodies appearing more commonly on the cold weather plates. Before and after hand washing prints were done as well. As seen in Figure 9 the hand washed with soap and water yielded a print with much less diversity with mainly normal body flora growing on the plate. 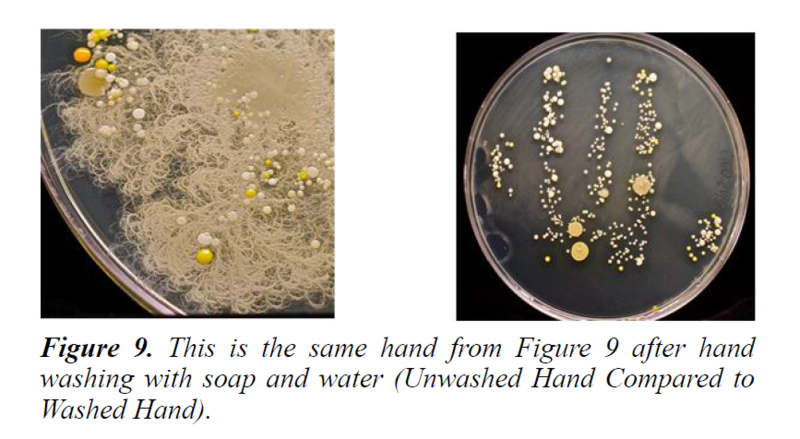 The unwashed hand had environmental bacterial present with numerous larger Bacillus spp. present as well as yellow yeast (Figures 7 and 9). Over the past several years hand washing and bacterial awareness has become more prevalent in the media. These images simply illustrate that numerous environmental organisms can hitch a ride on the objects they come in contact with whether it be a shoe or a hand. It is important to understand that although the images represent an unseen world it is not one that needs to be feared. Everything seen in these images are naturally occurring environmental organisms that are harmless to most healthy people and we need exposure to organisms to build a healthy immune system [7,8]. Although we rely on organism exposure it also serves as reminder to wash before eating to prevent possible disease as well. Conn JH. The Most abundant Group of Bacteria in Soil. ASM Bacterial Reviews. 257-75. Paredes-Sabja D, Setlow P, Sarker MR. Germination of spores of Bacillales and Clostridiales species: mechanisms and proteins involved. Trends Microbiol. 2011;19:85-94. Tan S Irene, Ramamurthi S Kumaran. Spore formation in Bacillus subtilis. Environ Microbiol Rep. 2014 Jun; 6(3):212-25. Hooper Lora V, Littman Dan R, Macpherson Andrew J. Interactions between the Microbiota and the Immune System. Science. 06 Jun 2012. Davis Mark. Immune systems of healthy adults 'remember' germs to which they’ve never been exposed, Stanford study finds.